Last year I related the story of “Steve,”a well-known pastry chef who came to my school to give a demonstration on How To Make Two Dozen Culinary Students (and Their Teacher) Hate You. After trimming a tart crust, Steve took a break from humiliating his captive audience, mashed the dough scraps together, and held the lump aloft for all to see. “I used to wrap these in plastic and store them in my freezer,” he whined, “then two months later I’d throw them away. Now I just throw them away.” He made a show of chucking the offending lump of dough, which was half the size of his crust, in the garbage. Wanting to be in every way opposite from Steve, I began wrapping and storing excess dough scraps in my freezer. When I make pie dough, I take the extra step of fraisage-ing, folding and rolling the dough, as though making puff pastry. The small amount of extra work makes for an exceptionally flaky crust, but when rolled out, it insists on becoming more square than round. Once trimmed to a circle, the cut-off corners are ample. I pressed my last set of scraps together into a sort of franken-crust, par baked it, and filled it according to a recipe from Once Upon a Tart, one of my all-time favorite cookbooks. 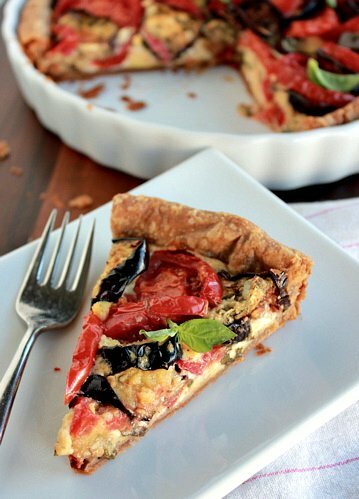 Frank and Jerome’s gem of a book chronicles (mostly vegetarian) recipes from their adorable New York cafe, and this tart is nothing short of spectacular. 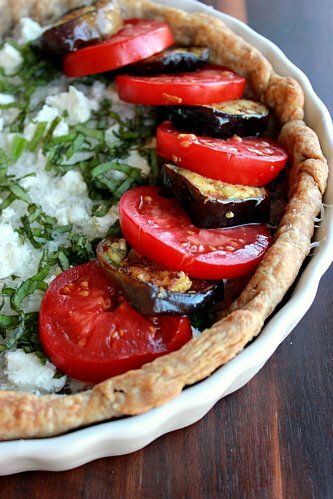 Parmesan, goat cheese and slivered basil form a bed onto which sliced tomatoes and garlic-roasted eggplant layer in concentric circles. 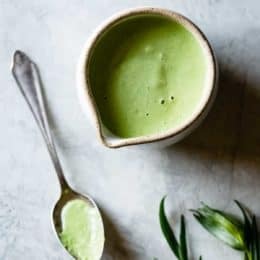 A simple custard brings everything together as it bakes, and small basil leaves make a simple and pretty garnish. This crust is as shatteringly flaky as the originals from whence they came, making a crisp foil to the meltingly-tender filling. 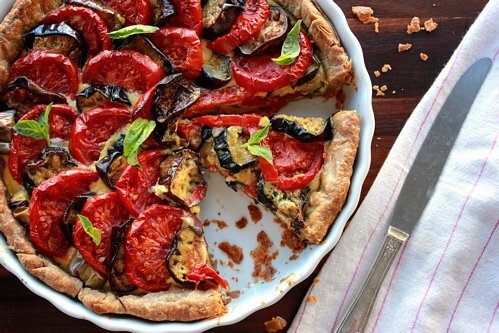 Dry farmed tomatoes, which are dense and low in moisture, prevent the tart from becoming soggy, their flavor intensifying in the heat of the oven. The layer of cheese beneath the custard also helps keep the bottom crust firm, and gives the tart big flavor.”It tastes like pizza,” Jay exclaimed after I’d shoved a slice into his mouth; it certainly satisfies like a gooey-crisp slice of pizza (especially a deep-dish slice of a Little Star pie). 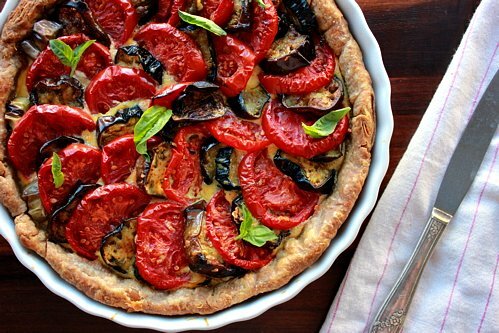 It reminds me of eggplant parmesan baked in a buttery crust. 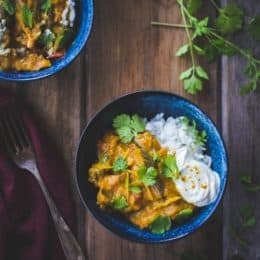 The flavors are summery and bright, but the rich dairy softens the bite of the eggplant into early-fall comfort. 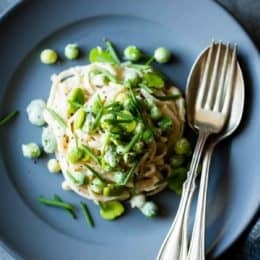 A green salad and glass of wine make it a perfectly nourishing vegetarian lunch or supper. Unless you have scraps with which to make a franken-crust, use your favorite pie dough, or the recipe below. The cultured dairy adds extra tenderness and flake, but you can leave it out, no problem – just add extra ice water. See this post on making puff pastry for pictures of the fraisage/folding/rolling process. (You may wish to make a double batch of dough if you do these extra steps; double-wrap it and store it in the freezer for up to several months.) Also note that a metal pan will conduct the heat more quickly than a glass or ceramic pan; if you use a metal pan, check the par-baking crust earlier than suggested. 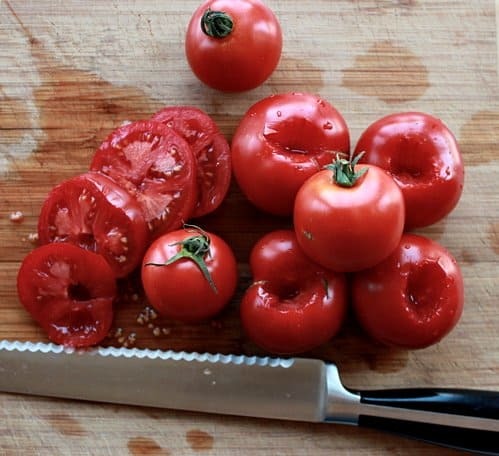 Dry-farmed tomatoes are my favorite, but you can substitute flavorful, ripe Romas or San Marzanos. 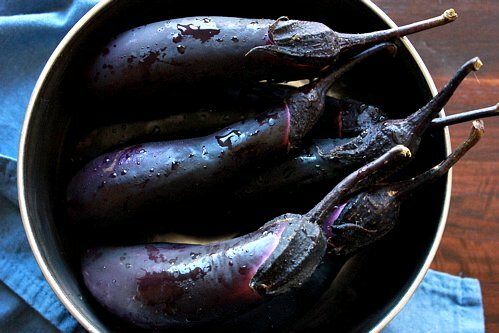 Small, fresh eggplants tend to be mild and sweet, and don’t usually need to have the bitterness sweated out. If yours are more elderly, toss the slices with a couple teaspoons of salt and let them sit for 30 minutes, then pat them dry, and taste a roasted slice before adding more salt to the recipe. Remove the dough from the fridge, unwrap, and place on a lightly floured surface. Roll out the dough into a 12″ circle, dusting the dough lightly with flour as needed, rotating and flipping it to prevent it from sticking. Ease the dough into a 9 or 10″ tart pan (or a 9″ glass pie plate), fit it into the corners, and trim it to a 1″ overhang. Fold the overhang into the pan, pressing to adhere so that the sides are double-thickness. Trim away any excess dough, and prick the crust all over with a fork. Save the scraps to patch any post-par-baking holes, and/or to make a future franken-crust. Position a rack in the upper third of the oven and preheat to 450ºF. 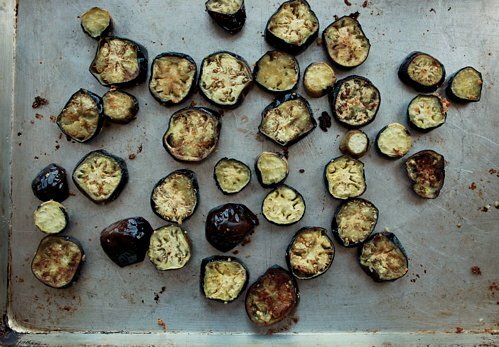 Toss the eggplant slices with the garlic and olive oil, and spread on a lightly oiled sheet pan. Bake untilthe eggplantbegins to brown, 10-15 minutes, flipping the slices if they are browning on the bottom but not the top. Remove and let cool. Position a rack in the bottom third of the oven, and reduce the oven temperature to 400ºF. Place the frozen crust on a rimmed baking sheet. Line the crust with a piece of parchment paper or foil, and fill with pie weights, dry beans, or clean pennies, pressing the weights into the sides and corners of the crust. Bake the crust for 15-20 minutes, until the dough will hold its shape when you lift off the parchment, then remove the weights and parchment and bake until the bottom is dry and lightly golden, about 5 minutes longer. (If there are any holes in the crust, patch them with a tiny piece of dough scrap.) Reduce the oven temperature to 350ºF. 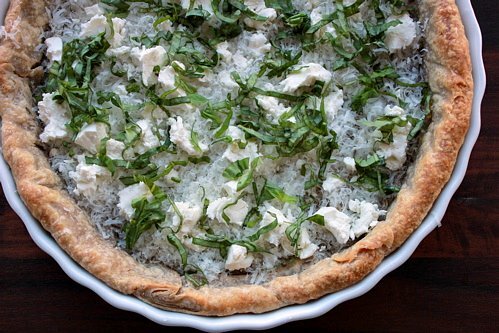 Cover the bottom of the par-baked crust with the parmesan, then crumble the goat cheese over, and top with an even layer of slivered basil. 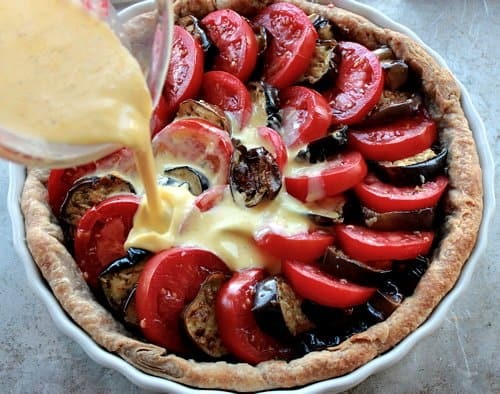 Layer the eggplant and tomato slices–alternating between eggplant and tomato–in concentric circles, beginning with the outside and working inward. Use small pieces to fill in any gaps, so that the crust is completely covered. In a measuring cup, whisk the eggs to break up the yolks, then whisk in the cream, salt, and a good grinding of black pepper. Pour the custard over the vegetables. Carefully transfer the tart to the oven and bake until the custard is set, firm to the touch, and doesn’t jiggle when you give it a shake, about 1 hour 10 minutes. Remove from the oven and let cool to warm on a wire rack. Garnish with basil leaves. Serve the tart warm. Leftovers will keep well for up to 3 days–re-heat before serving. Thank you for posting this! I made it for dinner last night. I had the OUAT cookbook, but I moved to France a few months ago and all my books are in storage back in New York. This was one of the tarts I missed. That's awesome! 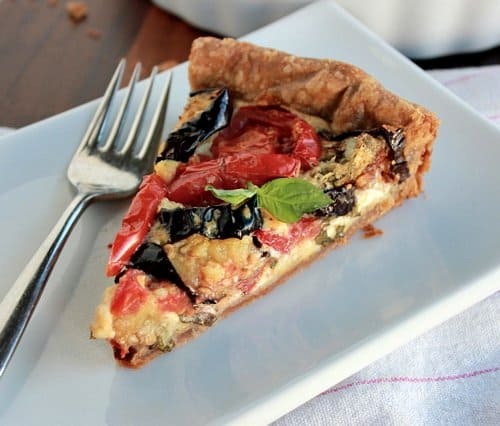 I love that book; I have a few other recipes adapted from there posted on this site, including their Apple Custard Tart, Caponata, Irish Soda Scones, and Two-Bean (Country) Potato Salad. Hope you're enjoying Paris. I made this Sunday too, and luckily the kids didn't want any! We adults gobbled it up, so next time I'll make two. I'm so glad this recipe didn't call for a lousy pastry chef. I do eat meat, but I draw the line at cannibalism. you forgot to mention how much sugar in the crust? Thanks for catching that! I've updated the recipe. It's optional!